In space no one can hear you scream. . .
but in blogland they can. 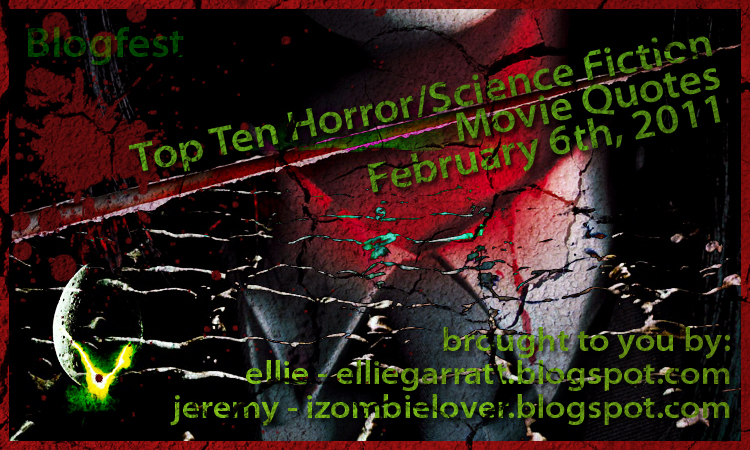 By popular demand "Ellie Garratt" and I bring you the Top Ten Horror/Science Fiction Movie Quotes Blog-fest. 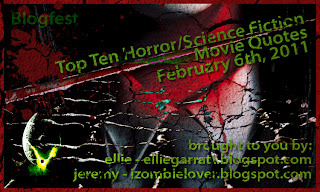 On the 6th February count down your top ten most memorable lines from your favorite horror and science fiction movies. Do ten of each or make your top ten a mix of both. It’s up to you. On a Sunday? You are twisted! Niiice, looking forward to hearing the results! You have been selected to be a member, but we do not exist. this is my kind of contest! can't wait :) oh, and love the new look. so many great quotes here.